Mullein, also known as Velvet Dock, is an annual wayside herb that seems to spring up where nothing else can take hold, even gaining a foothold between rocks and patches of concrete. Reaching a height of up to 8 feet, mullein is easily recognizable in the wild by the simple fact that it towers over most of its botanical neighbors. The plant also produces large, fuzzy leaves that resemble dried tobacco by the end of the growing season, and spikes of yellow flowers in mid-summer. Because mullein is very high in mucilage, the herb is traditionally used to make throat lozenges and syrups. It is also added to teas, used to produce skin care formulas or is tinctured. Verbascum thapsus is a biennial plant of the Scrophulariaceae family that produces a rosette of leaves in its first year of growth. The leaves are large, up to 50 cm long. The second year, plants normally produce a single unbranched stem usually 1–2 m tall. The tall pole-like stems end in a dense spike of flowers that can occupy up to half the stem length. All parts of the plants are covered with star-shaped trichomes. This cover is particularly thick on the leaves, giving them a silvery appearance. On flowering plants the leaves are alternately arranged up the stem. They are thick and have variation in leaf shape between the upper and lower leaves on the stem, ranging from oblong to oblanceolate, and reaching sizes up to 50 cm long and 14 cm across (19 inches long and 5 inches wide). After flowering and seed release the stem and fruits usually persist in winter, drying into dark brown, stiff structures of densely packed, ovoid-shaped and dry seed capsules. The plant produces a shallow taproot. Flowers have five stamens, a 5-lobed calyx tube and a 5-petalled corolla, the latter bright yellow and an 1.5–3 cm (0.5–1 inch) wide. The flowers are almost sessile, with very short pedicels (2 mm, 0.08 in). The five stamens are of two types, with the three upper stamens being shorter, their filaments covered by yellow or whitish hairs, and having smaller anthers, while the lower two stamens have glabrous filaments and larger anthers. A given flower is open only for a single day, opening before dawn and closing in the afternoon. Flowering lasts for up to three months from early to late summer. Many of the common names are in reference to the hairiness of the plant—such as wooly mullein, velvet mullein, hare's beard and similar. 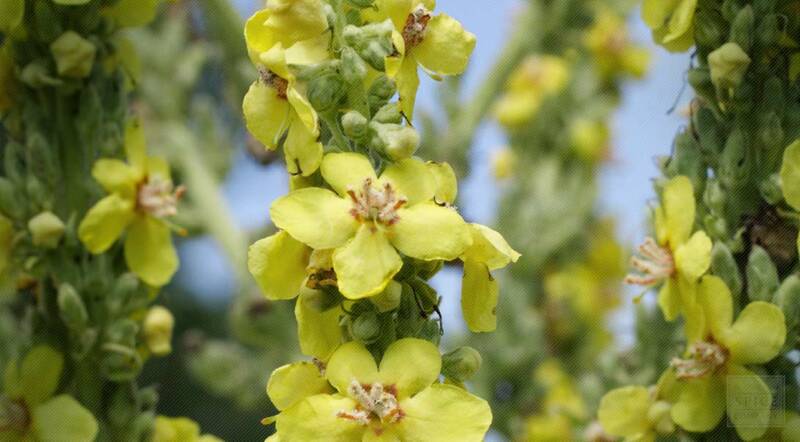 Verbascum thapsus is native to Europe, northern Africa and Asia, and introduced in the Americas and Australia. Mullein can grow in a variety of temperate habitats, including banks, meadows, roadsides, forest clearings and pastures. Mullein grows in bare and disturbed, usually dry, sandy or chalky soils. Seeds germinate in spring and summer almost solely in bare soil, at temperatures between 10 °C and 40 °C. Those that germinate in autumn produce plants that overwinter if they are large enough, while rosettes less than 15 cm (5.9 in) across die in winter. After flowering the entire plant usually dies at the end of its second year, but some individuals, especially in the northern parts of the range, require a longer growth period and flower in their third year. Under better growing conditions, some individuals flower in the first year. Since mullein has a relatively shallow taproot, making it easy and preferable to just pull up the whole plant. Harvesting is doen when in mullein is in flower and is dried for later use. The whole plant can be hung upside down to dry over a paper bag to catch seeds that may fall out. Store dried mullein in an airtight container in a cool, dry place. Mullein is an herb that you may not hear much about. 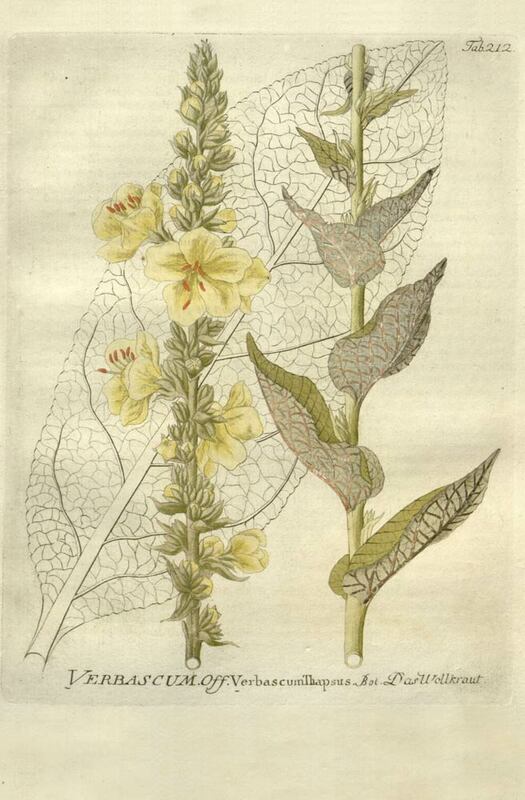 Mullein can be found in many forms including syrups, dried leaves and flowers, infusions, oils, and teas. Mullein is a hardy biennial that grows almost anywhere in temperate climes. During its first year, it produces a rosette of large, hairy, tongue shaped, greenish white, 6 to 15 inch leaves, hence many of its common names: velvet dock, flannel plant, and feltwort. In its second year, mullein sends up a solitary, fibrous stem that reaches 3 to 6 feet, the source of such names as Aaron's rod and shepherd's staff. A striking, cylindrical spike of small, dense, yellow flowers develops atop the stem. Mullein grows easily from seeds in light sandy soil under full sun, but it tolerates other conditions. Sow seeds in spring after danger of frost has passed. Harvest up to one-third of the leaves during the plant's first year. Harvest the rest the following year before the flowers bloom. Pick the flowers as they open. Harvest the roots during autumn. Mullein is a prolific self-sower. Many authorities recommend removing the flower head before the seeds ripen to keep it under control.